What Is the Bialetti Coffee Maker? How Does a Bialleti Coffee Maker Stand up Against Competitors? Are The Bialetti Coffee Maker Worth Investing In? This past summer, I took a trip to Italy with my family. I was enjoying the sights, food, and culture when I came across a coffee maker that I never saw before. It was a small, aluminum pot that heated coffee on the stove. The woman who made the coffee was a friend we were staying with. She showed me how to make the coffee in this pot. As a lifelong coffee drinker, this was a new experience for me. However, once I had my first cup of coffee from this pot, I was hooked. In my opinion, it was one of the best cups of coffee I ever had. I later learned what the pot was. It was a Bialetti coffee maker. These coffee makers are popular in Italy, but they are sold worldwide. The Bialetti company has made a name for itself as a leader in reliable and functional coffee makers. A Bialetti coffee maker, manufactured by the Bialetti Company, has a reputation for excellent quality and high performance. According to this website, The Bialetti Company, founded in 1919, was started in Italy by Alfonso Bialleti, who began his journey by opening up a workshop and making semi-finished goods in aluminum. He then invented the Moka express coffee maker in 1933. It revolutionized the way Italians made coffee. Since then, it has become an international company, specializing not only in coffee makers, but in kitchen appliances, cookware, and bakeware as well. 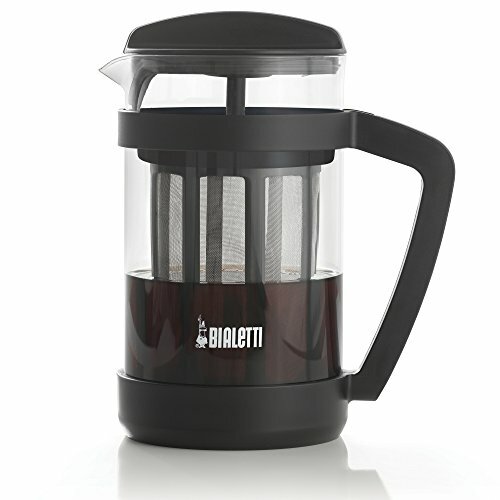 Bialleti coffee maker have different types, including the pour-over, french press, stove-top, cold brew, and capsule systems. Besides the coffee makers, the company has a wide selection of cookware and bakeware, including pots, pans, griddles, and pizza stones. We looked at ratings and reviews of each coffee maker on Amazon and compared the ratings and reviews to other websites, such as bedbathandbeyond.com and target.com. We also looked at the product features to make an accurate review of each coffee maker. The Plastic Pour-over is the highest rated of the three coffee pots, coming in at an Amazon rating of 4 out of 5 stars. Its filter holds two cups of coffee, it has an eight-sided design and allows full control of brewing time and temperature. Customers say that it is durable, light, and makes a smooth and satisfying cup of coffee. Customers also liked that the coffee doesn't have a plastic taste. Unfortunately, other customers don't like that it is difficult to find a filter that fits the pour-over, and it is not suitable for beginners because the bottom of the pour-over will fall off if they pour the coffee too quickly. You can find it on Amazon, bialetti.com, and at stores such as Target, Walmart, and Barnes & Noble. The percolator-type coffee maker is reminiscent of the classic design that has been around since the first Bialetti coffee maker, the Moka Express, made its debut in 1933. This coffee maker makes a rich espresso in minutes and is ideal for those who like a high-quality cup of coffee that is low maintenance. It comes in four designs: the Moka Express, Break, Brikka, and Stainless pots. MAKES 6 DEMITASSE ESPRESSO SHOTS - Capacity of 6 demitasse(1 1/2 oz) cups, prepare yourself with freshly-brewed espresso everyday at home and enjoy the moment with your family or friends, no need to repeat the process multiple times for multiple coffees anymore, put overprice coffee shop behinds! MADE FOR ITALIAN ESPRESSO LOVERS! The Sisitano Moka Pot Set was made for those who cannot resist an authentic, Italian espresso. Having your own Moka Pot and making your own rich and thick Italian coffee will also grant your loved ones. Sisitano Moka Pot can serve up to 6 cups of coffee per use. Smelling the ground beans when filling the coffee maker will bring your appetite for a full flavoured cup of espresso. HOW TO USE: Before use, please wash thoroughly to remove all contamination. Fill the lower part of the three part Italian espresso maker with cold or room-temperature filtered water, put the ground coffee into the filter, do not tamp it too tight! Screw the top on and place the aluminum Espresso Pot on the stove to boil. Just the feeling of making espresso in the traditional way is enough to relax you before you drink your cup of espresso. Your espresso is ready within minutes! QUALITY MATTERS: If you want to drink the most famous drink the proper way, you must be keen on the quality of your Stovetop coffee maker. 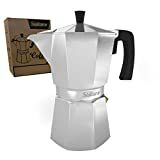 The Sisitano Moka Pot is made of aluminum so you can carry it with you for any of your trips and it can be used on both gas and electric stove-tops. Both the portable coffee makers and its renewed handle are both heat resistant. The Moka Express is the highest rated of the four coffee pots, coming in at an Amazon rating of 4.9 out of 5 stars. This coffee pot is resistant to heat and has a leak-prevention feature. It comes with 12 pencils to make designs in the coffee, a measuring spoon, and a clip to keep your coffee bags closed. The pot is made of aluminum and safe for both gas and electric stoves. You can make six espresso shots with one pot of coffee. Customers say it is a great quality pot that makes delicious coffee. The pot has no negative reviews on Amazon, but there are only 12 total reviews, so it is possible that the rating will go down. You can find it on Amazon and at stores such as Target, Bloomingdale's, and Bed, Bath and Beyond. Furthermore, you can find the six-cup version of the pot on bialetti.com. 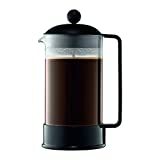 The French press offers the simplest way to make quality, traditional coffee, and the Bialetti French Press is no different. The Bialetti French Press comes in three designs: the Preziosa, Simplicity, and Trendy. Although all three designs of the Bialetti French Press have 4.2 out of 5 stars on Amazon, the Preziosa has 48 customer reviews, compared with the Trendy and Simplicity, that both have 32 reviews. The higher number of customer reviews makes the rating for the Preziosa the strongest rating of the three designs. 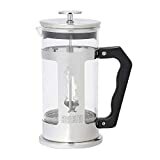 This coffee pot, made of 18/10 stainless steel, also has a heat-resistant borosilicate glass cylinder and makes 3-12 cups of coffee and has a signature handle similar to the Moka Express. Customers say it has a beautiful design, makes a great cup of coffee, and is durable. Unfortunately, other customers said that it breaks easily, the top fits poorly, and it makes less coffee than it claims to make. You can find it on Amazon and at stores such as Target and Bed, Bath and Beyond. 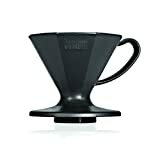 You can also find the eight-cup version on bialetti.com. With only one signature design, the cold brew coffee maker is for fans of the emerging coffee trend. Cold brew coffee is 65 percent less acidic than regular coffee. Also, it has 4 out of 5 stars on Amazon. Customers said that it is simple to use, durable, and makes coffee that is less bitter than traditional coffee. However, some customers said that it has a poor design, and the coffee grinds have to be very coarse, or the coffee mixes with the grinds. You can find more info about other bialetti coffee maker models on bialetti.com, wards.com, and at other stores such as Amazon and Bed, Bath and Beyond. The Bialetti capsule-system espresso maker is for those looking for a reliable, sleek, and quality single-serve espresso machine. It comes in two designs: the Diva and Mini Express. 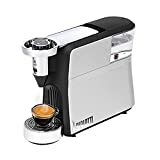 This coffee maker has 3.0 out of 5 stars on Amazon and is the only reviewed capsule-style espresso machine out of the two designs. The Diva has an adjustable height tray to accommodate different sized trays, a touch-sensitive button with two programmable options, and a 20-bar high-pressure system that results in the perfect Italian espresso shot. Customers said that it is an exceptional machine. However, some customers said that it arrived defective, and makes "weird noises" while making the espresso. You can find it on Amazon. The Bialetti automatic drip coffee maker is similar to other drip coffee makers, with an added sleek and classy design signature to the Bialetti brand. It comes in two distinct designs: Stainless Steel Programmable coffee makers and Triple-Brew coffee makers. BREW GREAT COFFEE: The Bialetti coffee maker simplifies your busy mornings with advanced features & design. Powered with a 1,200 watt brewing system & programmable up to 24 hours in advance, this unit brews great quality coffee that is ready when you are. VERSATILE & ECONOMICAL: Reduce waste with the 1-4 cup setting & sustainable & reusable permanent filter basket. Easily customize your brew strength & also enjoy the option to quickly pour a cup while on the go with the convenient pause & serve feature. The stainless steel programmable coffee maker is the highest rated out of the two coffee pots, coming in with an Amazon rating of 3.2 out of 5 stars. 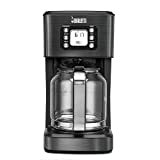 It has a 1200 watt brewing system, variable coffee strength, an automatic shut off, and is programmable for up to 24 hours in advance. Customers said that it makes better coffee than other automatic drip coffee makers and has a very nice design. Unfortunately, some customers said that the parts are not interchangeable, and the machine lasted less than a year. You can find it on Amazon and at Kohls. The Bialetti coffee maker have a lot of similarities to comparable coffee makers, but they also have unique qualities when put side to side with a competitor. The main factors we looked at when comparing the coffee makers were features, ratings, and price. The Nespresso Machine has quickly become a symbol of luxury in coffee worldwide. We compared its newest design, the Vertuo coffee maker and espresso machine, with the Bialetti Diva. At first look, they have more similarities than differences. They both have adjustable trays, used capsule containers, removable water tanks, and digital pour buttons. However, the Nespresso machine has some additional features, including an energy-saving function and a computerized scanning system that reads every capsule to ensure specific brewing. Furthermore, the Nespresso water tank is twice the size of the diva, and its width is twice that of the diva. Compared with the 3 out of 5 stars for the diva, this Nespresso machine got 4.4 out of 5 stars on Amazon. Lastly, it is more expensive than the Bialetti coffee maker. The Bodum French Press is on the list of the top ten French Press coffee makers of 2018. We compared the Bodum Brazil French Press coffee maker with the Bialetti French Press simplicity design. Both coffee makers are very similar. They both brew eight cups of coffee, are made of stainless steel, borosilicate glass, and plastic handles. Furthermore, both coffee makers have 4.2 out of 5 stars on Amazon. The main difference is in the design. The Bialetti has a stainless steel lid and glass base, whereas the Bodum Brazil has a plastic lid and base. Lastly, the Bodum Brazil is cheaper than the Bialetti coffee maker. Now you can create a 'coffeehouse' coffee - served steaming hot or iced cold, and in the comfort of your home - for much less than expensive signature coffee drinks! Also ideal for making tea. Includes a one year manufacturers warranty when purchased from an authorized reseller. The Toddy Cold Brew is in the list of top ten cold brew coffee makers of 2018. We compared it with the Bialetti cold brew. Both coffee makers make both cold brew coffee and tea, and they brew the coffee for 18 to 24 hours, for best flavor. The difference is in the design of each coffee maker. The Bialetti has one container that does it all. Its full carafe stainless steel mesh filter extends the whole length of the carafe, fully saturating all the grounds for an even-balanced coffee concentrate. However, the Toddy cold brew has a set of four items that come together to make the cold brew. The items are a brewing container, glass decanter, reusable filters, and rubber stopper. Furthermore, the Bialetti has 4.0 out of 5 stars on Amazon, and the Toddy has 4.5 out of 5 stars. Lastly, the Toddy is more expensive than the Bialetti coffee maker. When deciding whether or not to invest in a Bialetti coffee maker, it's important to consider what you're looking for, and what kind of coffee maker you need. For example, if you want a french press, then it's not worth the investment because the Bialetti french press is similar to other brands that are more inexpensive. However, if the cold brew coffee maker is more of what you're looking for, then the Bialetti cold brew is worth the investment because it is less expensive than other top brands, without sacrificing quality. Each model is different, with their own pros and cons. Before you invest in a Bialetti coffee maker, look at price, quality, and features.